If this was to happen in Australia the International Monetary Fund would be hammering at the door of the Reserve Bank. But Australia does not have a President’s Working Group on Financial Markets, commonly known as the Plunge Protection Team, that allows the US Government to prop up the markets by buying shares. 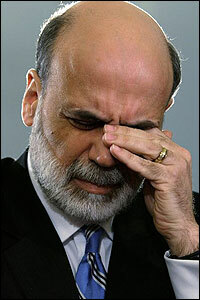 But to imagine the IMF investigating the US financial system is unthinkable, or was. But, at the weekend, Der Spiegel reported that the IMF would conduct a full investigation into virtually every aspect of it. Der Spiegel wrote that the IMF had “informed” Federal Reserve chairman Ben Bernanke of plans that would have been unheard of in the past: a general examination of the US financial system. The IMF’s board of directors has ruled that a so-called Financial Sector Assessment Program is to be carried out in the US. This, Der Spiegel wrote, “is nothing less than an X-ray of the entire US financial system”, adding that “no Fed chief in US history has been forced to submit to the kind of humiliation that Ben Bernanke is facing”. The Telegraph from London weighed in, following the Royal Bank of Scotland’s statement last week (also lost on the US public) that it was time to head for the crags, and reported Barclays Capital’s closely watched Global Outlook analysis that said US headline inflation would hit 5.5% by August and the Fed would have to raise interest rates six times by the end of next year to prevent a wage spiral. Under its by-laws, the IMF is charged with the supervision of the international monetary system. About two-thirds of IMF members – but never the US – have already endured this painful procedure. Part of the problem is the US media, which has for so long pretended that all is or soon will be well, a bottom is near, a recovery awaits in the second half of the financial year that will sweep away all problems, sown over decades, in a new expansion, a cycle that is ordained to come. The latest fantasy is that with the quarter’s end, new profit figures will invigorate the bull, which will seed fertility.